Workers repair streetcar tracks at 14th and G Streets NW in 1941. Source: Library of Congress More than 30 U.S. cities--including Washington--are now looking again to a late 19th-century transportation technology, the electric streetcar, as a tool to help revitalize business and entertainment districts and attract young professionals and empty nesters to consider urban living, according to a recent Associated Press article. Streetcars first came to Washington in 1862, when Congress chartered the Washington and Georgetown Railroad Company, which set up a line that began at Wisconsin Avenue and M Street NW in Georgetown and ended at the Navy Yard. For the first few decades, streetcars were pulled by horses. 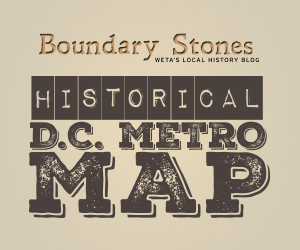 But in 1888, not long after Naval Academy alumnus Frank J. Sprague developed and demonstrated the electric streetcar, the first experiental electric line was set up between 7th and New York Avenue NW to 4th and T Street NE. The first chartered electric streetcar company was the Georgetown and Tennallytown Railroad Company, which began transporting passengers in 1890 and was backed by banker/developer John W. Thompson and a host of other local investors. (Here's an article by local historian Carlton Fletcher on that streetcar line.) Scores of other small streetcar companies soon sprang up. In the early days, the cars drew power from overhead wires, an arrangement that Congress eventually outlawed, because it didn't want the wires marring the view of the city's monuments and public buildings. According to early 20th Century rail historian William Tindall, one outfit, the Eckington and Soldiers' Home Railway, actually experimented with battery-powered cars, but found them impractical. By the early 20th Century, the chaotic patchwork of different streetcar companies had consolidated to just two operations, the Capital Traction Co. and the Washington Railway and Electric system. A 1918 report to Congress by the District's Public Utilities Commission noted that the war effort in the nation's capital had resulted in so many new commuters that the system was plagued by congestion and lengthy delays. "In some cities this period is called the 'rush hour,' but here it would be a misnomer, as the cars do anything but rush," the report noted. "A better name would be the 'crush hour.'" Along Pennsylvania Avenue, the rails were so clogged that between 5:45 and 6:00 p.m., the cars' speed slowed to just under three miles per hour. In 1933, the two competing District public transit companies merged to form a single outfit, Capital Transit. To improve service, the company invested in new equipment, including a fleet of state-of-the-art cars, But it made limited headway easing hte congestion, because it was saddled with one major disadvantage, according to transit historian Zachary M. Schrag. Due to the ban on overhead lines, the cars' power source was buried between the tracks. Each of the cars had a metal connector, called a plow, that ran down through a slot in the street to draw electricity. In the wintertime, the slots became jammed with snow and ice, and in the summer, the metal in the slots sometimes expanded and swelled shut. "Almost every day, at least one streetcar became disabled when its plow broke or became jammed, and an entire line stopped for 15 to 45 minutes while an emergency crew sped to the rescue," Schrag writes. Capital Transit was a conservatively-run company, paying paid low dividends to shareholders so that it could amass cash reserves to finance upkeep and upgrading of its equipment. As Schrag writes, however, that prudence ultimately became its undoing. The tactics kept the company's stock price low, and when federal antitrust regulators forced one of its major shareholders, a utility holdings company, to sell its stake, there were few takers. That in turn created an opening for financier Louis E. Wolfson, who had made a fortune in ventures ranging from building freighters for the French government to operating a chain of movie theaters that served African-American neighborhoods in the segregation era, according to historian Diana B. Henriques. Wolfson saw that Capital Transit's balance sheet was way out of line with its stock price. He jumped in with group that included his brothers and other associates, who snapped up 51 percent controlling interest in the outfit for just $2.2. million. According to Schrag, the new owners soon found a loophole in DC law that allowed them to dip into the company's built-up cash and revenues and pay out $8 million in dividends over a five-year period in which the company made just $5.2 million in net income. Congress fumed, but its investigators couldn't find grounds to stop the Wolfsons from burning though the company's reserves, which between 1949 and 1955 shrank from $6.7 million to $2.7 million. During that time, according to a 1955 Time article on Wolfson, he and his associates pocketed $3.6 million, collecting a 170 percent return on their investment. That put Capital Transit on precarious financial footing, at a time when ridership was starting to slip due to the rise in automobile ownership in Washington's suburbs. But what really started the DC streetcar system on a death spiral was strife between the Wolfsons and their unionized employees. We'll get into that in the next chapter of the saga. In the first installment of our Grave Robbing in Washington series, we look at the history of professional grave robbing in Washington.